Gerald of Wales was born at Manorbier castle, in Pembrokeshire, in 1146. He was educated at Gloucester and Paris, and became Archdeacon of Brecon in 1175. He visited Ireland in 1183, 1185, 1199 and again for about two years from 1204. A version of his text--which is largely concerned with the marvellous things he saw or heard about there--is known to have been read publicly in 1188. This manuscript was written perhaps at Lincoln, probably before Gerald's death in 1223, and it has been suggested that he personally supervised its writing and decoration. 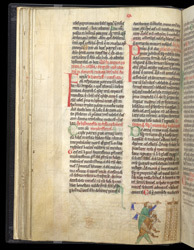 This manuscript was later owned by St. Augustine's Abbey, Canterbury. This page begins with a brief account of the discovery of the bodies of Saints Patrick, Columba and Brigit in Down followed by an unflattering account of Irish religion and social mores. The illustration shows the custom of always carrying an axe instead of a staff and giving deadly blows by raising it overhead. He says that there is no security because of axes--a play on the latin word (securim).